In a rapidly changing landscape of mass communication, the internet and social media, disputes over copyright are more common than ever. We act for a broad range of clients in relation to copyright, from international fashion designers and film studios, through to software designers and street artists. We have experience in assisting copyright owners assert their rights through a range of strategies, from licensing and assignments, to infringement actions. We are also experienced at representing clients accused of infringing copyright. Whether you are in a dispute over copyright ownership, or you need advice in relation to the commercial use of your work, our intellectual property (IP) lawyers will be able to guide you through this complex area. Copyright is the right to control the copying and distribution of original literary, artistic, dramatic and musical works, films, sound recordings, published editions and broadcasts. In Australia, there is no register for copyright, as it is granted automatically upon creation of the copyright material. Copyright protects many different kinds of material from great art, through to instructions on how to use a microwave, computer programs, photographs and buildings. Copyright arises once an idea is expressed in fixed form. For example, once a design for a logo has been created either on paper or electronically, it will be automatically entitled to copyright protection. The copyright will normally belong to the designer or their employer, even if the logo was commissioned by somebody else. It is possible to have an agreement that the copyright in the logo to be created by a design company will immediately belong to the person who commissioned it. Disputes over copyright ownership are common, particularly when several people have created the work, or it has been shared online. Copyright owners should treat their copyright like any other valuable property and be meticulous in keeping dated copies of their work, as well as copies of any letters or emails submitting their work to others. They should also include copyright ownership statements on their material. Our IP lawyers are experts in copyright ownership and protection, and we have a proven record in helping clients protect their rights. If you are unsure of your rights and obligations in relation to copyright, you can be confident that our IP lawyers have the experience and expertise to help you. 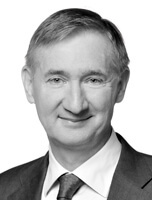 Greg is the Chairman of the Phillips Ormonde Fitzpatrick Board and has been with the firm since 1985. Greg initially worked in the industry as a corporate patent and trade marks adviser, and later worked with a general legal practice in Melbourne. He was a founding partner of Phillips Ormonde Fitzpatrick Lawyers in 1996, and is the firm’s senior litigator.